Mahalapye — The use of habit forming drugs has been identified as one of the factors that fuel mental illness. 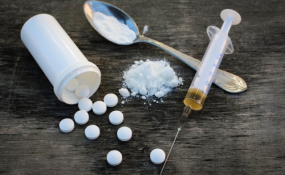 Officiating at a World Health Day commemoration in Mahalapye recently, a nurse from the psychiatric unit at Mahalapye District Hospital, Mr Barulaganyi Maome said rise in the number of psychiatric patients was linked to use of illicit drugs. Mr Maome said it was unfortunate that some elderly members of the society were making a living by selling illicit drugs, thereby compromising other people's health. He said the district hospital's psychiatric unit was attending to an increasing number of pupils from secondary schools with mental illnesses relating to use of drugs. "Through investigations, we have established that the drugs were supplied to pupils by elderly members of the society," he said. He said some of the drugs were stashed in fat cakes sold to pupils, adding that some of the pupils were used as distributors of illegal substances within the school premises. Mr Maome said it was unfortunate to observe that the general public was still in denial that mental and emotional health issues were a serious concern in the society. "The community is still in denial that mental illnesses exists," he said. He said the situation negatively affected people with psychiatric illnesses since they were being neglected. "Psychiatric patients are being stigmatised, neglected since no one want to associate with them," he said. Mr Maome appealed to members of the community to acquire more knowledge on mental illnesses and improve on the care rendered to psychiatric patients. He said being neglected and seen as adding no value to the society resulted in psychiatric patients getting depressed and giving up hope for recovery. Mr Maome further stated that psychiatric patients were faced with serious challenges as a result of neglect by the society. "They are being physically and sexually abused, starved and do not even receive support from family members," Mr Maome said. He said due to neglect, psychiatric patients were seen roaming the streets, wearing dirty and tattered clothing and receiving all sorts of abuse from the public ranging from verbal to physical abuse. Some, he noted, would even stay away from their families for days without anyone getting worried as family members were ashamed to be associated with them. Mr Maome emphasised the need for the general public to fully take note of mental illnesses and focus on improving their relationship with psychiatric patients as a way of assisting them to recover. Like any other persons with medical conditions, Mr Maome said psychiatric patients could only recover through the support of community. "Let us research, take heed of information provided by health practitioners and fully understand the disease," he said. Mr Maome appealed to members of the community to be at the forefront and work hand in hand with health practitioners to establish a healthy society. "Community involvement in universal health is paramount. As health practitioners we are here to serve the community and all we need is your support," he stressed.